I’ve planted fruit trees at every house we’ve owned (we’re on our third). At the last place I planted a North Star Dwarf Cherry Tree. I was impressed that there were 2 or 3 tart little cherries the same year I planted it from a bare-root twig. So when I started choosing fruit trees to plant at the new place, I knew I wanted another North Star. Before you purchase and plant cherry trees on your property, do some research to make sure you are planting the best varieties. How much space do you have? The North Star dwarf cherry tree is expected to reach approximately 10 feet tall and wide. That’s large enough to give a nice amount of fruit for our family, but small enough that we should be able to pick it without too many trips up a ladder. I also have a Montmorency Cherry tree that will get much larger, in the 15 – 20′ tall and wide range. I do have a concern about trying to get the fruit from the upper branches when that tree reaches full size. However, I have plenty of space for it to grow without getting scrunched or shaded by other trees. Do you want pie cherries or sweet cherries? I would love to have both, but our property is in zone 5b and can get below -20 degrees Fahrenheit in the winter. Sweet cherries might be ok here, but I decided to play it safe and just plant pie cherries. 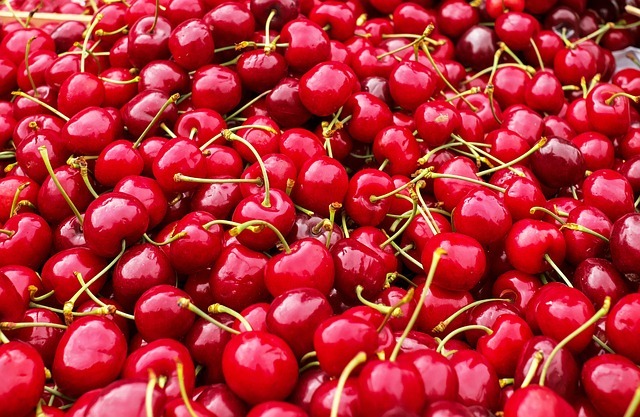 Sour cherries are more winter hardy than sweet cherries. Cherry trees don’t like wet feet. Make sure the soil is well drained where you want to plant your cherry trees. 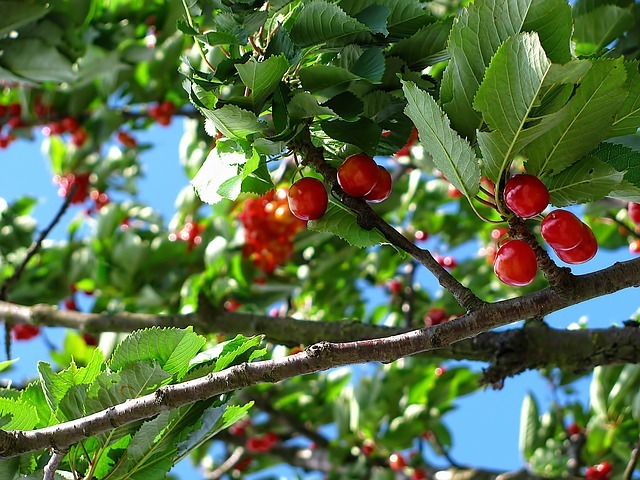 Heavy clay soil that holds moisture can cause problems for your little cherry trees, so check into that before you start ordering your fruit trees. Many cherry trees are self fruitful, meaning they don’t need another variety of cherry tree nearby for cross pollination. If you have room for only one tree, do your research to make sure the variety you choose is self fruitful. 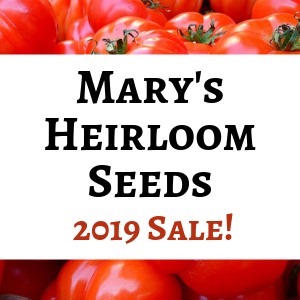 You will get better production if there are at least 2 varieties that are compatible pollinators close by, but for most families one tree will be enough. So far I haven’t found too many issues with the North Star cherry tree. There are some suckers that need to be pruned. Those suckers have attracted ants and their aphid flocks. But the tree doesn’t seem to be any worse for wear. Over the next few years I will need to train the branches to increase the crotch angles so the mature branches will be stronger. The Montmorency tree has the same issue. I’ve also noticed that it’s having some issues with powdery mildew on the leaves this year, but there are still some nice cherries coming in. This is the first year that I have picked more than 2 or 3 cherries from either of our cherry trees. There weren’t enough to make a pie or jam, but we had a few handfuls to eat fresh almost every day for a week from the North Star. Now the Montmorency fruits are ripening up and I’ll be picking them for fresh eating in the next day or two. Most of our fruit trees are in our chicken pasture, and get small amounts of chicken manure scratched into the soil each year. The Montmorency cherry tree has put on a great deal of green growth this year, at the expense of fruit production. So I think that next year I’ll try to rotate the chicken pen to leave the cherry tree outside the chicken poo range. Hopefully we’ll have a better harvest with that change. The North Star cherry is planted in an herb and flower bed in a protected spot between the house and barn. It has full sun every day and a nice bed of mulch, but it received no extra fertilizer this year. Next spring I will add some fertilizer with a higher middle number for fruits and flowers. A 5-10-5 fertilizer does nicely. Apply fertilizer in the spring when the leaves begin to unfurl. Never give your fruit trees fertilizer in summer or fall as it will encourage weak growth that is susceptible to winter damage. Your fruit trees may not need fertilizer every year. You may need to cover your cherry trees with netting to prevent birds from eating all the yummy fruit as it begins to color up. I haven’t put netting over my trees yet and so far the birds haven’t been a serious problem. It probably has something to do with our little black bird killer, Kit Kat. 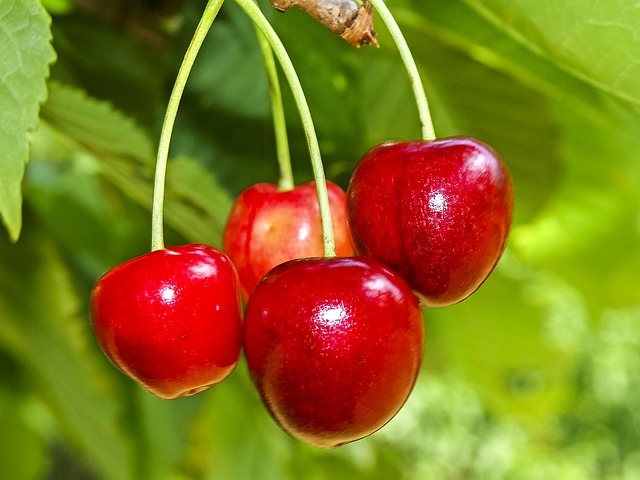 Do you have cherry trees on your homestead? What is your favorite variety? Hello! I’ve been doing a little research but can’t find the answer to my question. I have a rainier cherry tree and I will soon be purchasing another sweet cherry tree for cross pollination. I would also like to plant a tart cherry tree. I am thinking of a North Star. My question is, is it ok to plant sweet and tart cherry trees near each other? My yard is not huge, but room for the 2 sweets in the back yard, and maybe the tart in the front. Best wishes with your cherry tree project! Hi, my wife loved cherries. She passed away recently and she requested as a memorial, a tree be planted at her childhood parish school which is now a Jesuit middle school academy. They have agreed and we decided on a Montmorency Cherry tree, a self polinating variety, as there is not enough room for two tree’s. I know this species has had success in Illinois for over 100 years and the school is located in zone 5. Also, it would be good for the horticulture club to learn about caring for a fruit-bearing tree. They have mature and healthy landscaping already on the grounds. I am in the process of talking to a landscaping company that has worked with home builders and individual home owners, including my sister, for years. Any advise on where to look for a mature specimen and planting times? I’m very sorry to hear about your wife. How wonderful to plant a tree in her memory, and share the tree with others. Some things to know about cherry trees: They don’t like wet roots, so make sure the soil drains well; The larger the tree you transplant, the more difficult it may be for it to recover; Watch for black knot fungus on any trees you consider purchasing (this looks like a black, sooty material on the branches of the tree); Spring or fall are good times to plant. Happy to help, and I think that is a great idea. I’ve worked in landscaping and nurseries in the past and having someone you can go to look with is great. I have two Bali cherry trees and this year they had a bumper crop. Last year we had four cherries. Now we have frozen enough for more than ten pies. A paper clip pulls out the pit. Living in northern Minnesota, I was grateful to find a cherry tree for our zone. Nets to keep out the birds help immensely, as the robins love the fruit. Hi… I live in zone 5b and I grew 2 sweet cherry trees from their pits. I need to know when I can remove the trees from their pots, and plant them in the ground. The trees are about 3 feet high now, so do I wait till next year when the trees are bigger, or can I plant them in the ground now ??? The best time for planting trees is in the spring or autumn when temps are cooler and the trees have more time to recover from having their roots disturbed. I would plant them this autumn in a well drained spot that gets full sun. Don’t give them any fertilizer or compost until next spring. Too much nitrogen in fall encourages growth that is more likely to die over winter. Keep the roots from drying out, but don’t overwater because cherry trees do not like wet roots. I hope this helps…Best wishes! My 10 year old Montmorency is afflicted with brown rot and will have to be removed. I am, to put it mildly, not pleased! I easily became used to having more sour cherries than I needed, so my friends have been relying on my tree, too. So I will plant a North Star… and hope for the best. I’m sorry to hear about your cherry tree 🙁 You will find that the North Star doesn’t get as big or give as much fruit, so you might want two if you have the room. Best wishes with your new tree! Planted my dwarf North Star Cherry tree last summer, it promptly lost most of the leaves it came with, now (April) just twigs…so sign of buds. My husband thinks it must be dead. How can we tell if its going to bloom or need to be replaced? I’m sorry to hear that…I hope it’s ok. To check to see if your tree is still alive, scratch off just a little bit of the bark with your fingernail. Start with an outer branch and if there is no green under the brown outer bark, work your way down the branch to the trunk, scratching just a little bit of bark off each time. If you get to the trunk and there is no sign of green under the bark, your tree is most likely dead. Cherry trees don’t like to have wet roots. So if your soil is heavy clay or doesn’t drain well, you might want to put your new cherry tree is a different spot where the soil drains better. It’s also possible that the graft union where the root stock was grafted to the tree could have been damaged. If green sprouts come up from the base of the tree, those are from the root stock and will not be the dwarf north star that you wanted. I hope this helps. Brenda if the branches are dried and brittle its dead. if they can be bent a little and come back to shape its probably alive wait and see. I am looking for Montmorency tart cherry tree to buy. The cherries in your pictures look so good. And I never knew I needed to put so much thought into what type of cherry tree to plant. I’m really excited to read this since we will be moving to a place where I will be able to plant trees and did want to add a cherry tree to the mix! Pinning for future reference! Thanks for pinning! Love your photo, Helen 🙂 Best wishes with your new place! Don’t ruin your keyboard with that drool 😉 You should be able to grow pie cherries or some of the hardier sweet cherries. Depending on your climate, you could plant some trees this fall. I’d wait for the heat of the summer to pass, then look into planting in Sept or early Oct.
I’ll keep you posted on the cherry tree progress. should be your concern. hope this helps. also consider paw paws nice fruit and nice tree should not give you any problems in that zone also grew wild all over.